The intellectual, the moral, the religious seem to me all naturally bound up and interlinked together in one great and harmonious whole. Augusta Ada King, Countess of Lovelace (10 December 1815 – 27 November 1852), born Augusta Ada Byron and now commonly known as Ada Lovelace, was an English mathematician and writer, daughter of the poet Lord Byron. 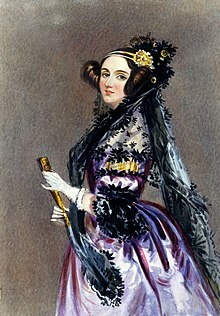 She is chiefly known for her work on Charles Babbage's early mechanical general-purpose computer, the Analytical Engine. Her notes on the engine include what is recognised as the first algorithm intended to be carried out by a machine. Because of this, she is often described as the world's first computer programmer, or the "mother of computer programming". Our family are an alternate stratification of poetry and mathematics. In a letter to Andrew Crosse, as quoted in Eugen Kölbing's Englische Studien, Volume 19 (1894), Leipzig; O.R. Reisland, "Byron's Daughter", p. 156. Circumstances have been such, that I have lived almost entirely secluded for some time. Those who are much in earnest and with single minds devoted to any great object in life, must find this occasionally inevitable.... You will wonder at having heard nothing from me; but you have experience and candour enough to perceive and know that God has not given to us (in this state of existence) more than very limited powers of expression of one's ideas and feelings... I shall be very desirous of again seeing you. You know what that means from me, and that it is no form, but the simple expression and result of the respect and attraction I feel for a mind that ventures to read direct in God's own book, and not merely thro' man's translation of that same vast and mighty work. In a letter to Andrew Crosse, as quoted in Eugen Kölbing's Englische Studien, Volume 19 (1894), Leipzig; O.R. Reisland, "Byron's Daughter", p. 157. Perhaps you have felt already, from the tone of my letter, that I am more than ever now the bride of science. Religion to me is science, and science is religion. In that deeply-felt truth lies the secret of my intense devotion to the reading of God's natural works. It is reading Him. His will — His intelligence; and this again is learning to obey and to follow (to the best of our power) that will! For he who reads, who interprets the Divinity with a true and simple heart, then obeys and submits in acts and feelings as by an impupulse and instinct. He can't help doing so. At least, it appears so to me. Englische Studien, Volume 19 (1894), Leipzig; O.R. Reisland, "Byron's Daughter", p. 157-158. In a letter to Andrew Crosse, as quoted in Eugen Kölbing's Englische Studien, Volume 19 (1894), Leipzig; O.R. Reisland, "Byron's Daughter", p. 158. With all my wiry power and strength, I am prone at times to bodily sufferings, connected chiefly with the digestive organs, of no common degree or king. I do not regret the sufferings and peculiaties of my physical constitution. They have taught me, and continue to teach me, that which I think nothing else could have developed. It is a force and control put upon me by Providence which I must obey. And the effects of this continual disciple of facts are mighty. They tame the in the best sense of that word, and they fan into existence a pure, bright, holy, unselfish flame within that sheds cheerfulness and light on many. — Ever yours truly. "A. A. Lovelace." I may remark that the curious transformations many formulae can undergo, the unsuspected and to a beginner apparently impossible identity of forms exceedingly dissimilar at first sight, is I think one of the chief difficulties in the early part of mathematical studies. I am often reminded of certain sprites and fairies one reads of, who are at one's elbows in one shape now, and the next minute in a form most dissimilar. As quoted by Menabrea, Luigi (1842). Sketch of the Analytical Engine invented by Charles Babbage Esq.. Scientific Memoirs (Richard Taylor): 694. [...] engine is the material expression of any indefinite function of any degree of generality and complexity. As quoted by Rosen, Kenneth H. (2013). Discrete Mathematics and Its Applications, McGraw-Hill, ISBN 9780071315012. p.29. Bromley, Allan G. (1990). "Difference and Analytical Engines" (PDF). In Aspray, William. Computing Before Computers (pdf). Ames: Iowa State University Press. pp. 59–98. ISBN 0-8138-0047-1. p. 89. A large, coarse-skinned young woman but with something of my friend's features, particularly the mouth. John Hobhouse as quoted in Turney, Catherine (1972), Byron's Daughter: A Biography of Elizabeth Medora Leigh, Scribner, ISBN 0684127539, pp. 138–39.